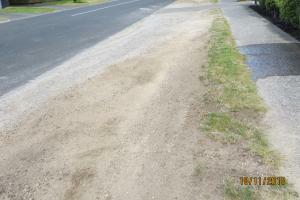 The verge outside the property of 39 Brice Street needs repairing. It was once used as a car park for the church across the street which was the Jehovahs Witness church which has now moved to Kiddle Drive. The current owner is now the Taupo Samoan assembly of god. The condition of the verge is a mixture of metal and pumice. It becomes a dust bowl during the dry season and is hazardous to children who have asthma and allegies. My husband is an amputee, incomplete paraplegic so it falls upon my shoulders to try to fix this eye sore. We don't mind if it is still used for a car park for the church but would like the council to help out with its repair whether it be cobbles or grass. I have already sprayed the area for weeds and have started repair work on the remaining grass but we need help. Thank you our neighbourhood appreciates your support. This issue has not been fixed. Hello, to confirm with you, Coucils policy is that the maintenance of berms in front of residential properties is the responsibility of the adjoining property owner. Request closed as per policy.